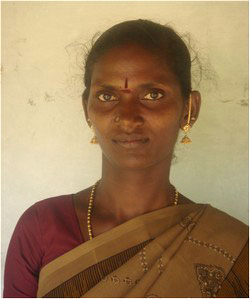 Maitri (a VST partner) encouraged us to start self-help groups in my village. At that time I used to go for agricultural work with my husband. I have two young sons so I often had to miss work which meant we went short on money. Then I got a loan for 6,000 rupees from the Women’s Federation to start a shop selling everyday provisions. The shop was a success so later I took another loan for 10,000 rupees to expand it. The profit my shop makes is more than twice what I earned as a labourer. Through training sessions at Maitri I have also leant to basket weave, which I do when the shop isn’t busy. I can honestly say that Maitri has brought me from the darkness to the light. Before they came to my village, I didn’t fully realise my problems or the possibilities in my life. Now I am very aware of my problems, and how I can tackle them. I don’t have to go to money lenders anymore, which is a great help, and my whole family is much better off financially. My two children are in school and we own a television set now. I’ve become the president of my self help group. In my group we talk about village issues and how to tackle them. Then we go to the village elders with our views, and these days they listen. Slowly the men and women of my village are beginning to work together.